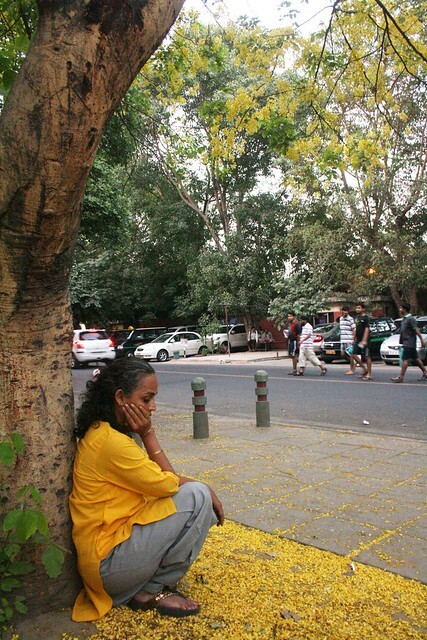 One summer evening The Delhi Walla sighted his most beloved Delhiite – author Arundhati Roy. 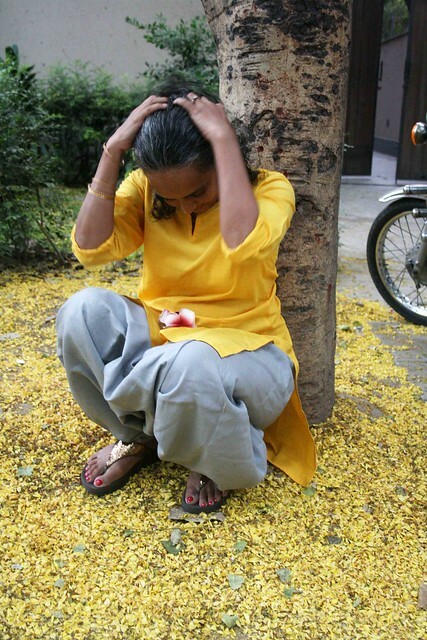 She was standing under an Amaltas tree, close to Khanna Market, an un-posh bazaar in Central Delhi. 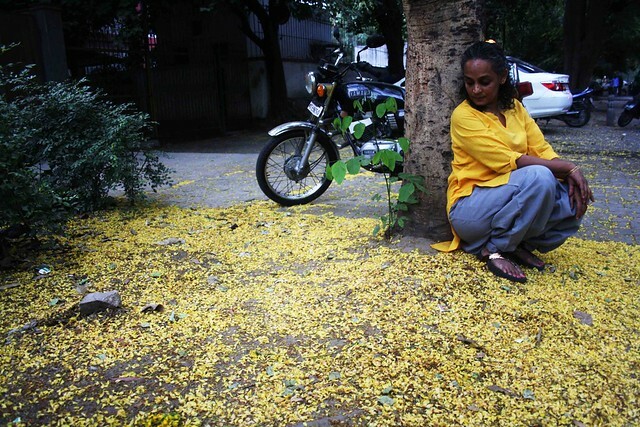 The tree was covered with the season’s yellow flowers that were falling on the ground. 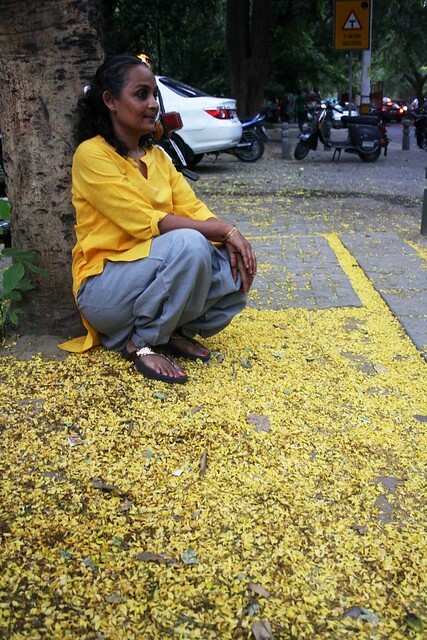 The pavement had turned into a bed of yellow. 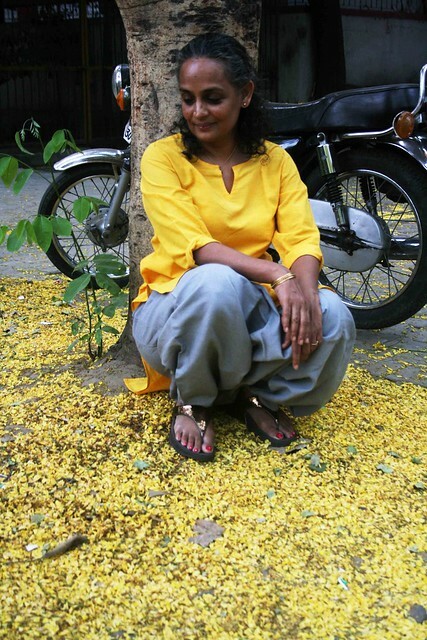 The author of The God of Small Things was in a yellow kurta. 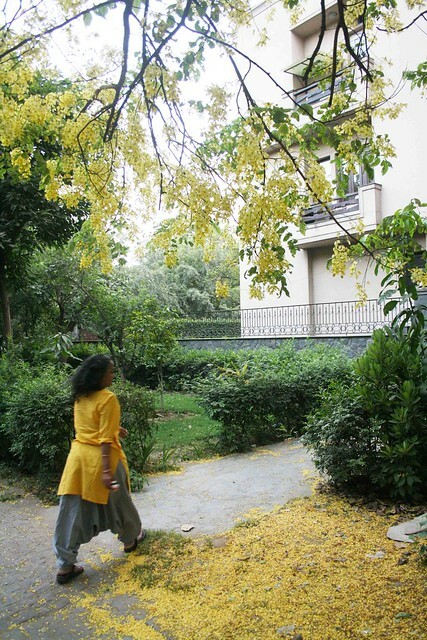 She looked up at the Amaltas. 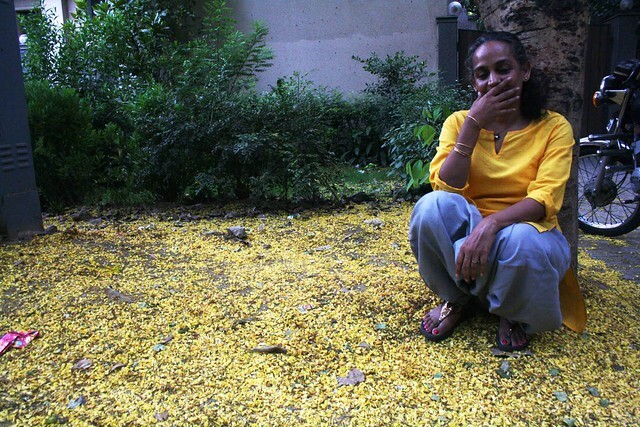 A moment later, she looked down at the fallen flowers. Half-smiling, Ms Roy seemed to be travelling in a dream. The evening traffic was moving fast. She remained still. 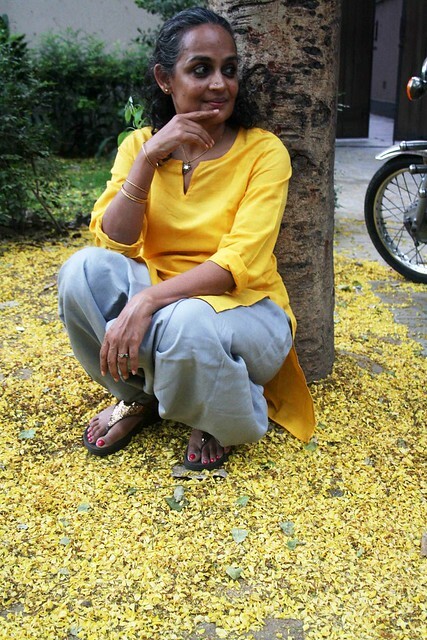 She then sat down under the tree. Her whiteblack hair was in a knot. Her skin was dark. She undid her hair. It fell, in waves and curls. She buried her head in her arms. Ms Roy gathered up her hair, wrapped it around her face and peered down the road through its parted strands. (Am I imagining things?) 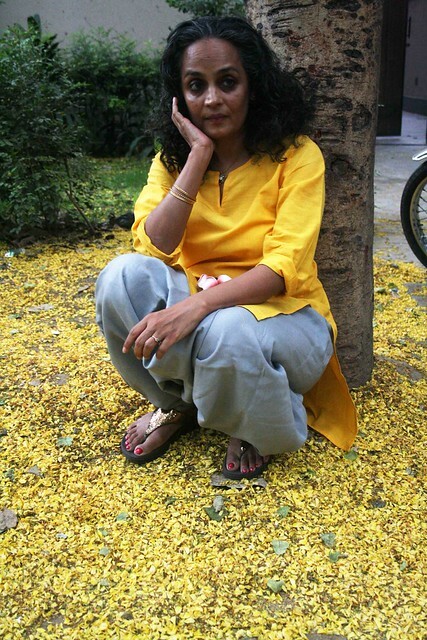 She stared fiercely out at the yellow flowers. Suddenly she rose and walked out of this hopelessly practical world like a witch. To a more beautiful place. Perhaps. You’re a gifted writer, Mayank. I envy you. Did she know you were there? oh boy! Mayank, you are soooooo moonstruck! By the way, it says it will be 45 degrees, with a partly cloudy sky. That is just evil. 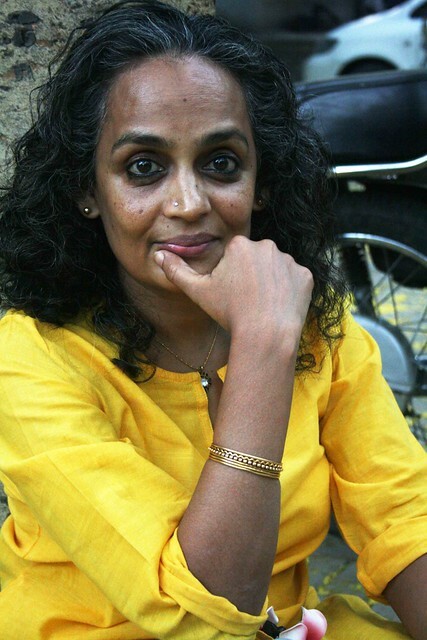 She may be older than my mum, but i find Arundhati irrestible. Words cannot describe how I felt when I read her God of Small Things. Words can’t describe how I feel for her. Lucky you Mayank.